Again, thanks to some very generous suppliers, recently I have been testing some pretty darn impressive microphones. Quite simply, the sE RNR1 comes from amazing heritage – Designed and built by Mr. Rupert Neve and sE Electronics, this mic is very nice indeed! So, like in the last posting, the audio sample below is a basic voiceover in the very well treated room. I’m using a JoeMeek threeQ preamp – totally flat. 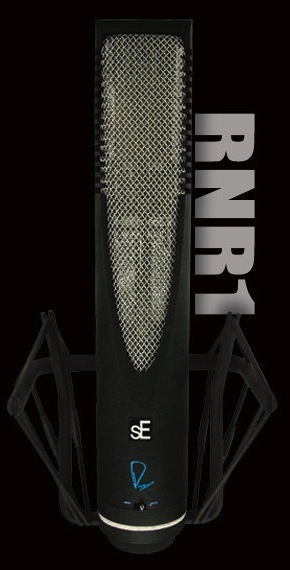 For many decades Ribbon mics have been used by engineers for their extremely natural sounding reproduction of source material. The nature of their performance differs greatly from condenser mics, which by comparison sound very ‘up front’ and lack the harmonic depth of a good ribbon. Rupert Neve’s new custom circuit design now allows high frequencies to be captured and output from the capsule for the first time ever in pristine detail. Standard performance of the RNR1 is an unprecedented 20Hz to 25KHz – three times the frequency range of even the best available competitor ribbon mics on the market today! The microphone is exceptionally well built, very solid and sturdy with a lovely shockmount. It was a pleasure to work with this mic, both behind it and on the other side of the glass 🙂 …but for me personally, on my voice…not my favourite. As with the last review, I’d like for you to make up your own mind from listening to the sample below. Feel free to go back and listen to the other samples from previous and future reviews – it’s nice to have comparisons. Please leave comments below, I’d love to hear what others think of this mic. I don’t want to seem biased in any way, remember my previous caveat …everyones voice is different and the same mic does NOT suit everyone.